The surface energy balance of melting snow and ice has been studied extensively, although there are still some unresolved questions. The first challenge is to decide whether a snow or ice surface is two- or three-dimensional; that is, is it a surface or a volume? It is both in some ways. There is a two-way exchange of energy between the atmosphere and surface, through several different processes of energy transfer, and this determines the net energy that is supplied to or lost from snow or ice during a given time interval. At the same time, some of the energy fluxes at the surface, such as transmission and reflection of shortwave (solar) radiation, involve the upper several centimeters or decimeters of the snow-pack or the ice. Turbulent eddies that are responsible for sensible heat flux (defined later) also transport energy and moisture to the subsurface. Additional energy fluxes within snow and ice are associated with heat conduction, percolation of melt or rainwater, and latent heat release from refreezing of meltwater. 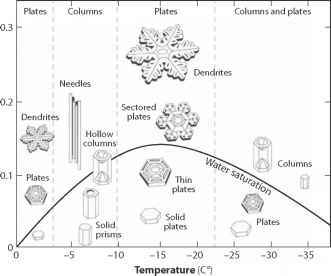 It is useful to discuss snow and ice thermodynamics separately with regard to (i) the surface energy balance, describing exchanges with the atmosphere, and (ii) the internal energy balance (i.e., conservation of energy within a snowpack or a finite thickness of ice). I return to this internal energy balance in the next section. where QS* is the incoming shortwave radiation at the surface and QS- = asQS* is the reflected shortwave radiation, for albedo as. QL* and QL- are the incoming and outgoing longwave (infrared) radiation, QG is the subsurface energy flux associated with radiative transfer and heat conduction in the snow/ice, QH and QE are sensible and latent heat fluxes, and Qp and Qr represent sensible heat advected by precipitation and runoff. These energy balance terms are pictured schematically in figure 3.1. Figure 3.1. Schematic for surface energy balance processes for snow and ice. of sublimation and deposition; melt energy is budgeted separately in QN, even though this is also a process involving latent energy. Here,ps is the snow or ice density,pw and Lf are the density and latent heat of fusion for water, d is the thickness of the snowpack or the layer of ice of interest, and c is the specific heat capacity. Equation (3.2a) gives the melt rate in terms of the rate of change in snow or ice thickness (rather than water equivalent). When there is an energy deficit in case (3.2b), m is negative, corresponding with refreezing. In this situation, surface water refreezes before the underlying snow or ice will cool, following (3.2c). The third equation represents the change in internal energy of the snowpack or the ice layer, assuming a bulk volumetric heat capacity (rsc). In reality, both density and heat capacity vary with depth, and solution of (3.2c) requires consideration of the energy balance over the full thickness of the snow or ice, resolved at different depths.